While the world’s attention, headlines and political action are focused now on ISIS, Syria remains one of the most dangerous places in the world to be a civilian. Improvised weapons – like barrels full of explosives or mortars made from gas cylinders – cannot be targeted, and so make no distinction between civilians and fighters. These weapons are being dropped on „markets, hospitals and schools that continue to operate in desperate conditions and amid constant threat of attack.“ said the United Nations in February 2014. Yet more than six months after the Security Council demanded an end to these indiscriminate attacks, they are being used more frequently. 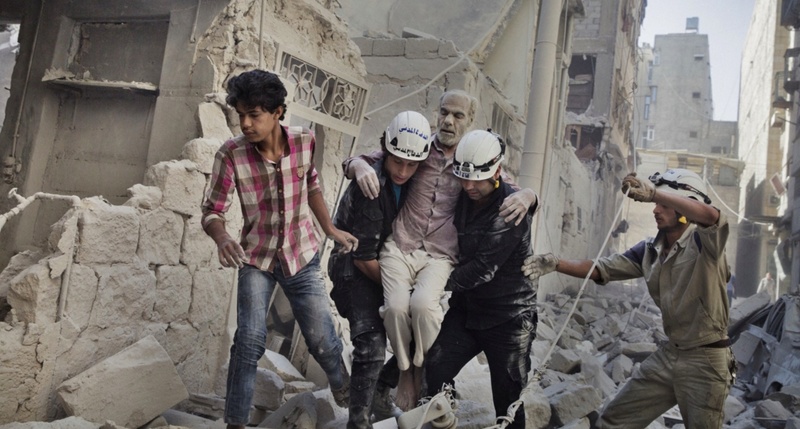 While there is no help to be seen arriving a group of volunteers formed the White Helmets. These young men head out every day to save lives – fully aware that more bombs may fall on the same site. Actually, this happens systematically, because the armed forces of the Syrian government know that civilians arrive in search of survivors. More than 50 bombs and mortars a day land on some neighbourhoods in Syria. Many are rusty barrels filled with nails and explosives, rolled out the back of government helicopters onto homes, schools and hospitals. The White Helmets have saved 2,514 lives in the past year alone – and this number is growing daily. Read the capturing reportage on the Hanano Civil Defense in Aleppo on Medium, and support The White Helmets here.